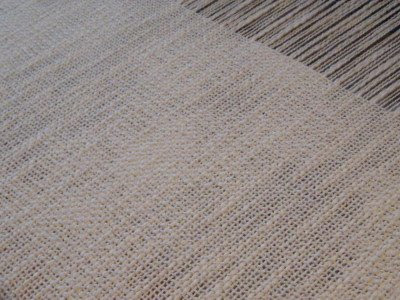 There's been an interesting discussion on the Weaving list about plain weave. 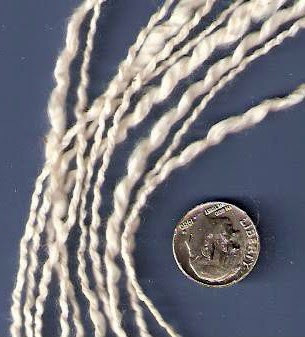 This most basic weave structure is the one almost every beginning weaver starts with it. It's simple over 1 - under 1 - over 1 - under 1 structure is the easiest to understand, and probably because of that, seems boring pretty quickly. 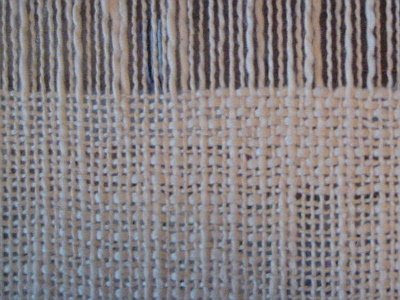 Then there are others that I haven't explored much, such as warp or weft faced weaves. Another fun thing is plain weave with space dyed yarns. While waiting for my tied weave study group, I decided to see what this yarn would look like in plain weave. I can't say that it looks like much at the moment, but it is interesting to watch as it weaves up. It will be either a scarf or a shawl, depending on how much it shrinks after washing! At any rate, it's weaving quickly. Hopefully it will be off the loom by tomorrow. Oh! And if you like kitty pictures, be sure to check out my "helper." Plain weave is underrated. I guess because so much emphasis is placed on complex weave structures at places like ACC and other craft shows. I adore plain weave. I have tried others, probably too quickly. 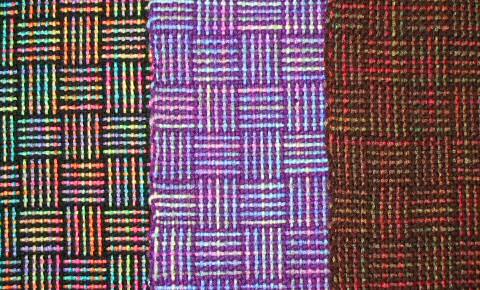 But plain weave, like stockinette stitch in knitting, is hard to beat for rhythm and elegance. I love plain weave- and I mean PLAIN weave. I love fabrics where the fibre, the texture and the colours are the features. Not to say I don't admire the really complex fabrics- but when I see something like your lovely 'flake' yarn plainweave whatsit, I just *sigh*. I think it will make a nice scarf I really like the plain weave. 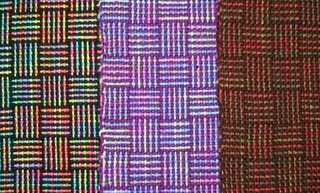 My weaving teacher always said that plain weave was her favorite structure. She loved to work with color and texture, and created beautiful fabrics. 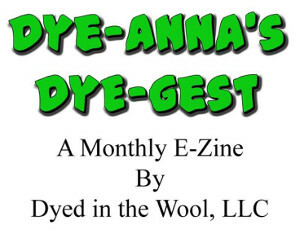 It's also quicker and there's not need for a floating selvedge! although i never leave comments i frequent your blogan count it among my faves.i've nominated you for the i love your blog award. I agree with you and everyone who have left a comment. I love plain weave!! Some times we forget that the possibilities are endless limited only by the weavers imagine. Since I own a RH plain weave is my mantra. I love it and the possiblities are endless. 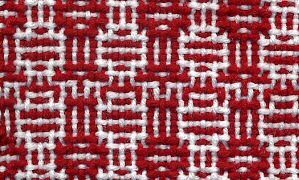 Just want you to know, I've found your beautiful plain weave image on google images, and am using it in my Intro to Weaving lecture tomorrow! Plain weave has always been my favorite structure as well. Great job!